Front Office module has two alternative graphical interfaces. Room-Date layout is one of them. It shows room status in 10 consecutive days starting from a date specified by the user. Through this page, the user performs all front office functions like check in, reservation, day use, change Room, guest deposit , bill inquiry, check out, ... etc. The Other interface is Floor-Room Layout which shows the status in one day only but displays the rooms in each floor.The first two columns show room type and room number. room numbers are sorted within room types. The remaining 10 columns show the status of rooms in 10 consecutive days. each date cell shows the status at the corresponding date above it, and for the corresponding room to the left of it. The status are shown on colors as explaned on the ledgent under the matrix. The current room status is shown on the room cell itself, the second column. Check In: Opens room occupancy page to check in a resident guest in the room selected and with the date selected as the arrival date. Reservation: To reserve the selected room for a guest. If a date selected, That date is considered as the arrival date of the guest, otherwise a calendar will be opened to select the arrival date. The room occupancy page is then opened to write down the reservation data. Day Use: Day use is similar to check in, but for guests, who require residence for part of day, so the duration is computed by hours and not nights. Change Room: Is used to move guests in the selected room to another room. Pricing: To change the room prices of rooms in check-in status when the user selects an occupied room cell. It displays the residence cost for reserved room when the user selects a date cell of reserved room. Deposit: To accept down payments for checked in or reserved rooms. Room Bill: To display the bill of checked in rooms as of today. The user can change the up to date in the form to see the bill values as of the date required. 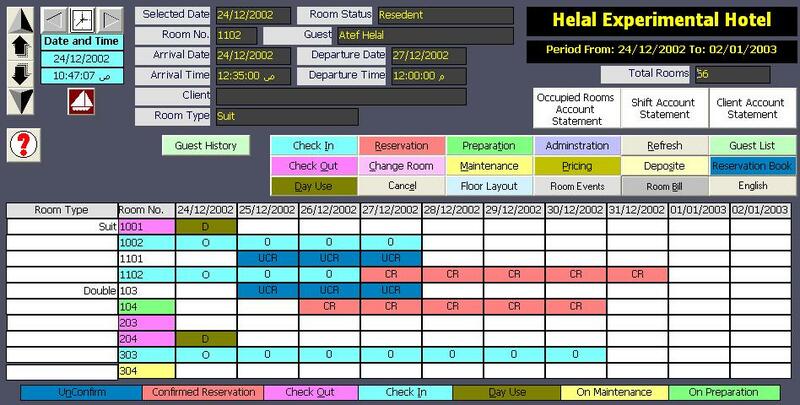 Room Events: To display all operations carried out on rooms at any shift. Guest List: to display in-house guests. Administration: To open the administration menu for performing administration tasks like changing room billing, printing bills after check out, selecting front office cash book, ... etc. Reservation Book: To display a reservation list. Bill Language: To change the language of the bill. The system prints the bill in two languages. For example: Arabic and English. The language name written on the button is language used to print the bills. Clicking on the button will change the language. Refresh: Reloads the rooms status. Preparation: to clear the status of the rooms under cleaning and preparation for residence. After check out, the room status changed automatically to under preparation. This button is used to change its status to vacant. Maintenance: to change the status of a vacant or on preparation room to under maintenance. The maintenance status is not cleared under maintenance is done in the room service module. Floor Layout: switches to the alternative interface of the front office module. Check out: to check out checked in rooms (for residence or day use). The bill is printed and the room status is changed to on preparation. Cancel: to cancel the search operation and hide the search parameters. Occupied Rooms Account Statement: Prints Occupied rooms account as of today. Shift Account Statement: Prints all accounts of the shift to hands over the shift. Client Account Statement: Displays and prints the account statement of all rooms related to a specified client.